So, Superman is not a big, chisel-jawed white Jewish guy from New York, after all*. He is a weedy little black guy from 3000 metres up in the Great Rift Valley in Kenya But one who runs long distances so fast it’s as if he is running down from that altitude to sea-level. His name, in case you’ve been away for the weekend, is Eliud Kipchoge. And yesterday morning, in the still dim dawn of an almost chilly Monza morning, Kipchoge ran the marathon distance in 25 seconds over two hours. Paced or not, by a combination of electric car and world class runners; with spring-heeled shoes that may ultimately be banned by the authorities notwithstanding; it was a superlative exploit. And it couldn’t have been achieved by a nicer guy. Superboy, ie the 18 year old Kipchoge first leapt from the telephone booth with 450 metres to go in the World Championships 5000 metres final in Paris 2003. Seeing that he risked being boxed by colleague Abraham Chebii, he had the presence of mind and ambition to slow just before the bell, drop back and side-step, then find another gear which took up him up the leaders. And not just any leaders!  The unknown was not only trading strides with all-time ‘greats’ Hicham El Guerrouj and Kenenisa Bekele (who had earlier won the 1500 and 10,000 metres respectively), he dashed both of their hopes for a double by consigning them to defeat with a magisterial last lap of around 53sec, provoking the observation from James O’Brien, luminary of the New York AC, sat next to me at St Denis, “I’ve never seen El Guerrouj lose form like that”; and so he had, stretching for the line that came too late. 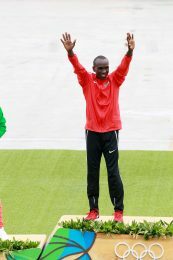 What’s more the teenager evoked history, through sharing a name with an illustrious predecessor, another all-time great, his older compatriot Kipchoge Keino, double Olympic champion from the sixties, and the grandfather of Kenyan long-distance running. When this latter-day Kipchoge failed to repeat the feat at the Olympic Games in Athens 2004, finishing third this time, to El Guerrouj and Kenenisa, I began to formulate a theory that his maintaining Jos Hermens as manager, when Hermens’ group seemed to be deployed principally to favour the Ethiopians Haile and Kenenisa, was a mistake. But he stayed with Hermens, and when I finally asked Kipchoge about this, at the Belgrade Race Through History 2010 (where he finished second in the 7k race to that one-season skyrocket, Josephat Menjo), he told me he’d always been happy with Hermens’ agency. However, this being an opinion piece, albeit one based on a lot of experience and information, I can say whatever I like, within reason. And you are free to write in and disagree. There were many terrific performances in the interim; silver in the World Champs 5000 metres in Osaka 2007, another silver in the Olympic Games 5000 metres in Beijing 2008; and a string of victories on the circuit. But Kipchoge only came into the maturity that his Paris performance had suggested ten years earlier, when he switched to the marathon in 2013. Following a 2.05.30 course record debut in the Hamburg Marathon that year, his only defeat in eight marathons (not counting today) came later that year, when, while improving to 2.04.05, he finished second to his colleague, Wilson Kipsang’s WR 2.03.23, in Berlin. Since then he has won in Rotterdam and Chicago 2014, London and Berlin 2015, and London and the Olympic Games 2016. 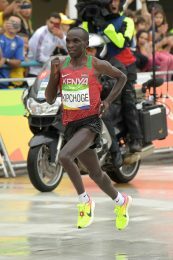 After today’s exploit, it seems that Kipchoge has called ‘time’ on any further such ‘record’ attempts, thank god (or superman), and given that Nike will earn millions for their new shoes from the stunt, I hope and trust that Kipchoge got at least one of those millions as a pay-off, if not an extra one as a bonus. And here, particularly, I trust Jos Hermens was watching his employer’s back. So he will never break two hours, because proper races, no matter how set up with pacemakers, motorised or otherwise, don’t work like Monza; although it is clear from his superb competitive record, and the evidence of this superlative time-trial, that there is no better marathoner currently than Kipchoge. And having clocked 2.03.05 almost inadvertently in London 2016, then won the Olympic title in Rio as if by divine right, should he set off on the race-track that is the Berlin Marathon (September 24 this year), those celebrated arbiters of fate, the bookies will not be betting against him taking more than a few seconds off his quite ordinary (sorry Dennis) compatriot, Kimetto’s world mark of 2.02.57. This was a well-written article, and the comparison of Kipchoge’s feat with something only Superman could do, is appropriate. I think it’s obvious that all committed runners will understand how unbelievable this was, but I’m still not sure that the general public has any idea. Even in the case of the 4 minute mile, which has been talked about for more than 60 years, people don’t know just how freaking hard it is ….even to run a mile in under 5 minutes! As a first year member of my high school’s cross country team in North Carolina (years ago) I remember the coach having all of us run a mile as fast as we could. 5 minutes and 50 seconds (LOL) and I felt like collapsing. * Only one interesting thing I would like to point out. After Kipchoge won the marathon gold medal in Brazil last summer, he said that Galen Rupp would probably break the world’s record in the near future. I actually believe that’s possible. We’ll see! And yes, you’re right. Superman really was intended to be Jewish. I found that out and used on a reading test for my students around 12 years ago. A 4:35 mile wins most high school dual meets. A 9:10 two-mile wins most high school state championships. A 14:15 5000m runner is a real contributor on any NCAA Division I cross country team. A 28:30 10,000m runner is an all-american at university and has a reasonable chance at finding his way to a professional sponsorship upon graduation. It is incredible to think about the vast gap between the professional athlete who can run at 4:35-mile pace for 6.2 miles (10000m) and the athlete who can do that AND THEN turn around and continue running at 4:35-mile pace for twenty more miles! Well written piece. Just to add, Kipchoge is not 32 years old, I am pretty sure he is in his mid or past mid 30’s. With that being said, there are a lot of younger Kenyans marathoners who can ran faster than Eluid given the opportunity with that kind of pacing. Kipchoge however, has been very consistent in his marathon running.